Home-made sugar-free applesauce is a family favorite. It is very easy to make and when you use a mix of fall apples, the only ingredient that you need is … Apples…no sugar is needed. Every fall, I make enough to store in the freezer that will last us through the winter and into spring. There is no sugar in my homemade applesauce, so it is frequently a side dish for many of our dinners throughout the cold months. 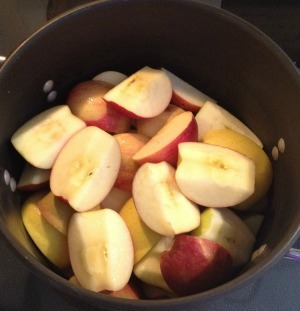 My secret to sugar-free homemade applesauce: Use a mix of apples. My applesauce doesn’t need an ounce of sugar because I use a blend of apples that range from sweet to tart. I buy every variety available in my favorite local orchard store, sometimes up to 8 varieties at a time. Varieties such as Ginger Gold, Yellow Delicious, Honey Crisp, Gala, McIntosh, Fuji, Jonagold and Jonathon are included in my sauce. To be honest, I don’t know how much I actually save by making my homemade applesauce, because it is labor intensive. However, the taste just doesn’t compare to store bought and my family devours my homemade sauce. 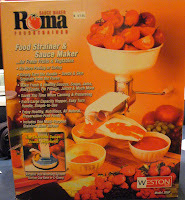 To make it easier, I do use this handy gadget: Roma Food Strainer and Sauce Maker for Fresh Fruits and Vegetables . Mine is a hand-me-down from my mom and it makes the job easy and fast. If purchasing new isn’t an option, I have seen them at yard sales or check thrift stores. I have made my sauce with my Instant Pot and it was very easy, however, my kids didn’t like the consistency as much as the sauce made with my food mill, so I continue to use it instead of the IP. 1. 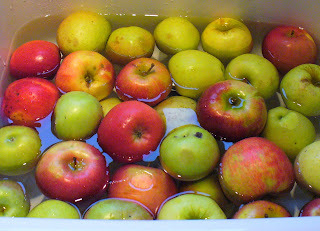 Soak and wash the apples with white vinegar and rinse with water. Cut the apples into quarters. I don’t peel or worry about the seeds…you’ll see why below. 2. 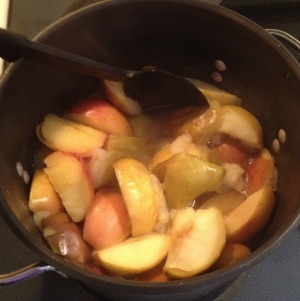 Put the apples in a big soup pot and add a little water in the bottom of the pot so that the apples don’t scorch. Cover and cook on medium until they are mushy. Stir often to also avoid scorching. 3. 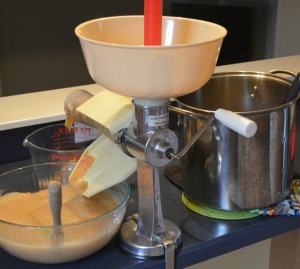 When the apples have cooked soft and mushy, remove from the stove and start to process through the food mill. Be careful – the apples are HOT! Put the cooked apples in the funnel and turn the handle. The applesauce just slides through a screen and down into the bowl. The funnel on the left in the picture below is the waste funnel. All of the skin and seeds are pushed through that funnel and into my garbage bowl. This is a picture of the peels. They can be tossed in the trash or compost. 4. 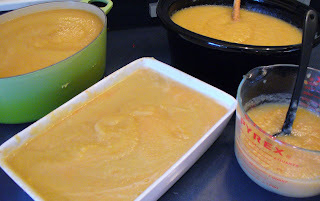 Allow the finished applesauce to cool and then put into freezer containers. My applesauce doesn’t need an ounce of sugar because I use a blend of apples that range from sweet to tart. In the past I only used one variety, Ginger Gold, because it is my favorite apple for pies, but when using them for applesauce I felt it needed a little sugar in to sweeten a bit. But the secret to making delicious applesauce is using a blend of your favorite apples. Do you make your own applesauce? What are your favorite apples to use? Great way to make applesauce! Gosh, you are a better woman/mother than me! Looks great. Wow. I don’t make my own applesauce but probably would if I had a contraption like that. I love that you use so many variations to leave out the sugar. This is so awesome and inspiring. Thanks for linking up at Momtrends. I tweeted your recipe. Are you on twitter? My son only likes freshly made applesauce. He doesn’t like applesauce from the store. This was a good reminder to me that it is time to make some. Nicole – Thanks for tweeting my post. I am not currently on twitter, but probably should get out of the ice age and join in! 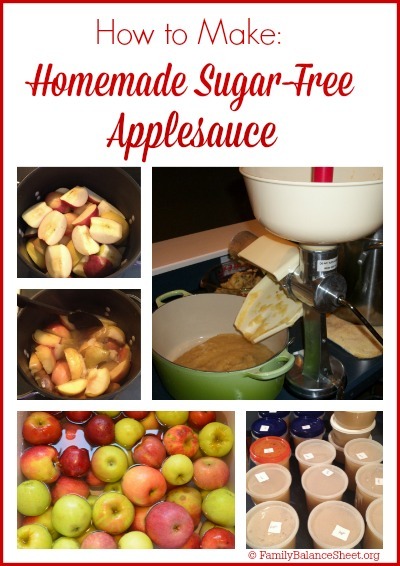 What a great way to make applesauce! Thanks for sharing your recipe and technique with us. Have a wonderful day. We really love homemade applesauce. You’re looks so yummy… and I know your house smelled fantastic! Excellent! I have a Champion juicer to make apple juice, but I’m going to keep my eye out for one of those contraptions. What a great tool. I would love to come across one so there would be no more coring and peeling! I would love for you to join me for Crock Pot Wednesday next week. I did make applesauce for my son once, but it took so much time and for such a small return. I haven’t made it since, but yours looks fabulous. I will have to look into getting a strainer like you have. I love that gadget! I always find that adding lots of cinnamon helps reduce the sweetener needs, too! 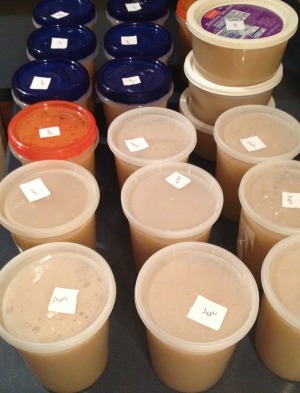 @Seasons of Life – I have never canned the applesauce before. I have only frozen it. Thanks for stopping by and commenting.